Volatile oil prices have distorted the Consumer Price Index; removing them reveals that inflation has been running at a relatively stable 2% rate for the past 12 years. No one—especially the Fed—needs to worry that inflation is too low. If anything is too low, it is Treasury yields. As the chart above shows, the year over year change in the headline CPI has been unusually volatile in the past decade. 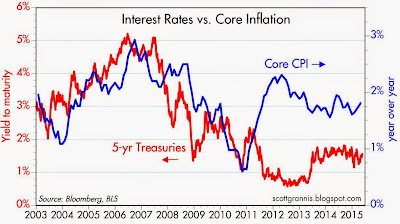 Core inflation (ex-foor and energy) has been much more stable. The main difference between these two measures of inflation is oil prices. 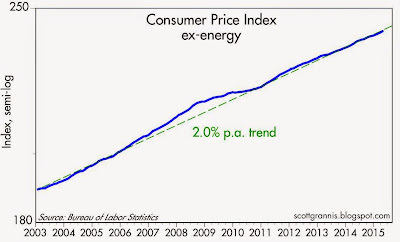 The chart above plots the CPI index ex-energy on a semi-log scale to show that it has been increasing at a 2% annual rate, on average, since 2003. There is no indication at all that the underlying rate of inflation today is any more or less than it has been for over a decade. For all intents and purposes, inflation is only slightly less than 2%, which is precisely what the Fed has been aiming for. 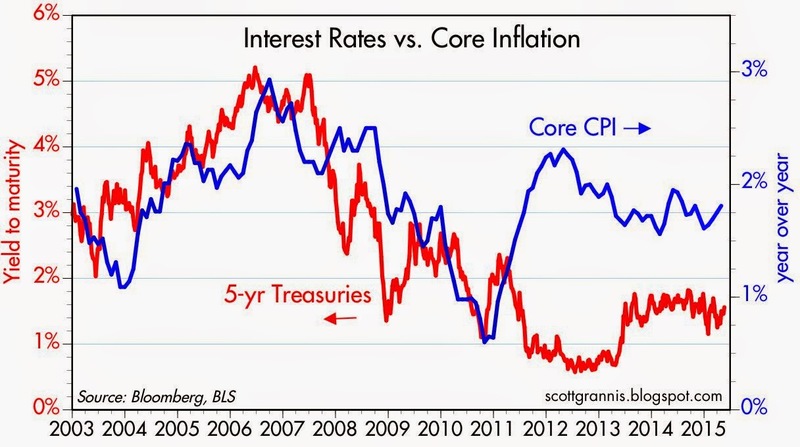 The chart above compares the year over year change in the Core CPI to 5-yr Treasury yields. Yields tracked inflation trends fairly closely from 2003 through early 2011. Beginning around mid-2011, the PIIGS crisis began to erupt, pushing the Eurozone economy into a recession, which in turn raised concerns that the U.S. economy was vulnerable to a double-dip recession as well. Strong demand for the safety of Treasuries, fueled by risk aversion, has kept sovereign interest rates abnormally low—relative to underlying inflation—for the past four years. 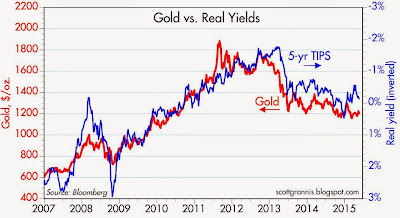 Fears of a Eurozone credit crisis sparking another financial collapse also drove gold prices to $1900 in September, 2011, while strong demand for the safety of 5-yr TIPS drove real yields deep into negative territory. The world was terribly concerned that economic growth was going to be miserable and financial markets were at risk. Demand for the safety and security of gold, Treasuries, and TIPS was intense. As the chart above shows, demand for gold and TIPS eased measurably in 2013, but remains relatively strong: risk aversion has eased somewhat but it is still very much with us today. 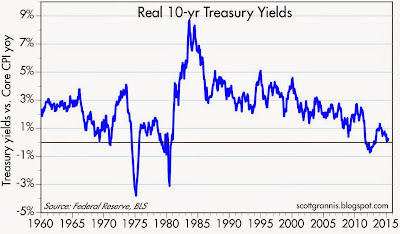 The chart above shows the real yield on 10-yr Treasuries (using the Core measure of CPI) since 1960, during which time real yields by this measure have averaged 2.4%. Today's level of real Treasury yields is clearly abnormally low from a long-term historical perspective. The reason for this, I believe, is the persistence of risk aversion and an enduring skepticism about the prospects for economic growth. 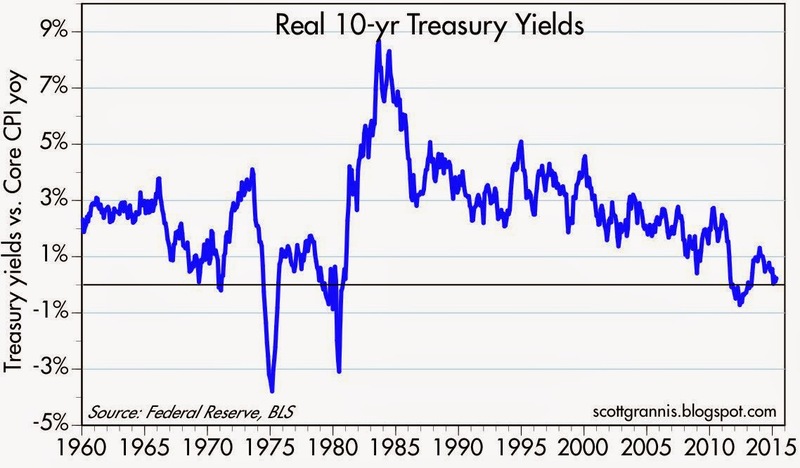 If economic policies were to become more growth-oriented, and if regulatory burdens were to decline, it's reasonable to think that Treasury yields could almost immediately rise by 150-200 bps or so, thus restoring real yields to more historically "normal" levels. The Fed says it targets 2% inflation not on the CPI, but the PCE deflator. The Fed has been below target for seven years. Given global supply lines into the U.S., it might take years of robust economic growth before the Fed can reach its inflation target. Side note: In the U.S. Q1 GDP was flat, and maybe H1 will be flat. The CPI is showing headline deflation. The Fed has not hit its PCE IT target for seven years. Yet the Fed, led by academic Janet Yellen, is constantly blabbering about raising rates. Kuroda, the BoJ governor, said he is sticking with QE at $80 million a month, and will do more if they do not hit their 2% inflation target consistently through 2016. Maybe the the BoJ will "overheat" the Japan economy. I think more likely the Fed will suffocate the U.S. economy. I can take a little heat, btw. Scott, with this very low inflation, do you believe the price of gold will trade sideways for a few years, rise or fall to $800 which you identified in an earlier post comparing gold to other commodities. Thanks for your post and blog. I enjoy it. Tim: Remember that gold is a global commodity. Prices are set in India and China. 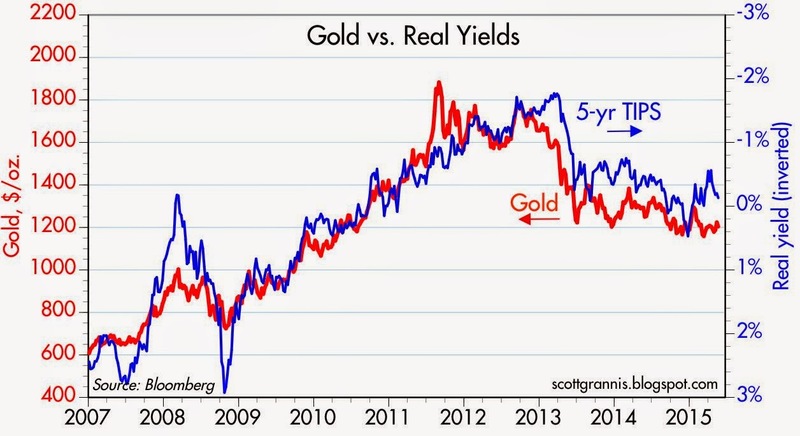 The US inflation rate is a minor side show in the global gold carnival.. In the UK, they have. "Could the first sub-1% mortgage rate be around the corner? Actually, it is already here. While the Co-op Bank recently launched a 1.09% two-year fixed-rate mortgage (which will move back to the standard variable rate (SVR) at the end of the term), HSBC has beaten this with an initial rate of 0.99% on its two-year discount special mortgage. The average two-year fixed mortgage rate has fallen to under 2%, while the average five-year fixed rate is under 3% (Figure 1). And if you shop around, you can now find sub-2% five-year fixed rates too. So in the UK, you can take out a five-year mortgage at under 2%, they say. Is that our future in the U.S.?